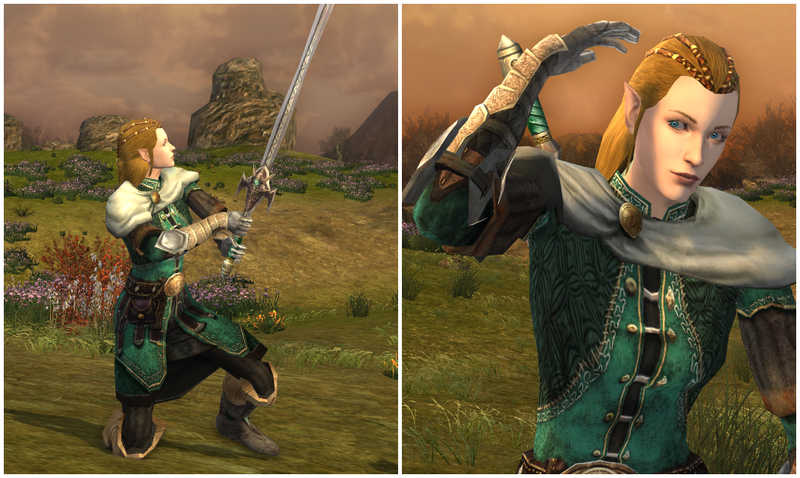 Outfitting the graceful Gwaimallin, my High Elf, has been quite a challenge. Almost all of her outfits have taken a different approach. Versus piecing together clothing from various sources and the then selecting the appropriate weapon, I've been selecting the weapon first and trying to base the outfit around it. It hasn't been as successful as I hoped. Versus creating a matching style, I've found myself simply using the colors found in that weapon and hoped a random clothing combination would work. 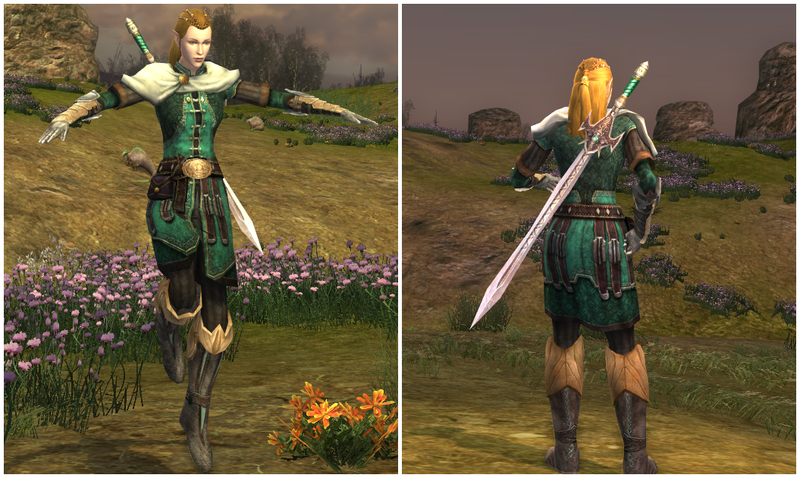 I was surprised how wonderful this outfit looked, drawing upon a unique blend of LOTRO's more recent cosmetics. 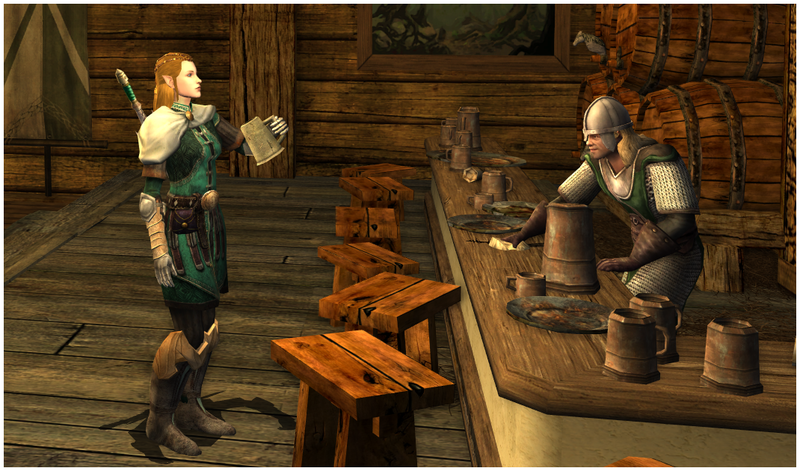 At least I felt it was befitting of a High Elf. It looked light and graceful. Ceremonial yet practical. But at the same time, I couldn't tell if it was a perfect fit for her, the weapon, or both. In a way, the weapon-centric outfitting method became the inspiration for my Cosmetic Weapons Project. That being said, I do apologize for the lack of actual outfit posts. I decided to make my project a priority, given the size and scope of it. Once the first wave ends, which will be in a few weeks with two-handed axes, outfits will once again have the spotlight. In the meantime, I hope everybody that's been reading the content here, at Material Middle-earth, has also been enjoying the massive library of weapon skins. 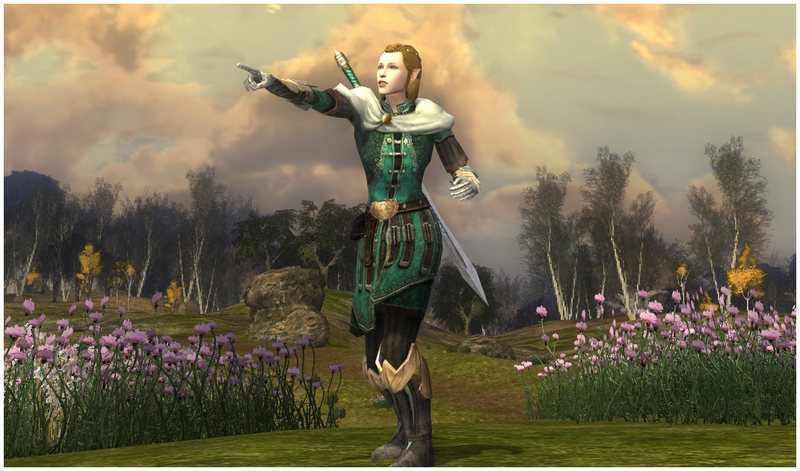 It's been my goal to complete it by the end of the calendar year, providing those playing LOTRO with an even greater ability to enhance their character's appearance.